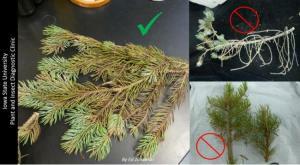 Proper sampling of tip blight diseases in conifers. The sample on the left shows a mixture of healthy and symptomatic tissue. The picture in the top right shows a sample where the symptomatic tissue has already been shed and the photo on the bottom right shows only healthy tips in absence on symptomatic tissue. Pine wilt: If you observe a pine tree (particularly an Austrian, Scots or other non-native pine) decline very rapidly a sample should be submitted to test for pine wilt. This requires a branch that is at least 2 inches in diameter and approximately 1.5-2 feet long. If you are uncertain of what type of sample to collect, please email pictures of the tree/trees in question, and we can direct you on what type of sample to collect. Proper sampling of pine tree for pine wilt. The pictures on the right and top left show banches that are at least an inch in diameter and showing blue staining. 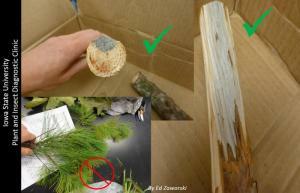 The picture in the bottom left shows an improper sample, where the branch is not thick enough to properly assess for the presence of pinewood nematode.